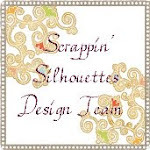 Today I am introduced as part of the Design Team over on Scrappin' Silhouettes. I feel extremely blessed to be on the team with so many fabulous scrappers and I am definitely the baby when it comes to experience. Please go over to Scrappin Silhouettes to see this weeks pages as created by Amanda, Molly, Stephanie and me! This weeks sketch uses 4 photographs, which made it more challenging for me as I generally only use 1 or 2 but I really loved putting this page together. I seriously need to take better photographs of my big old Layouts so if you have any tips on how to make them look better/more professional I am all totally open to suggestions! I would also like to enter this LO into the 'Holiday' challenge over at Creative Craft world. Fluffy what a great Layout. I might have a try ;o) Cant help with photos as mine of my cards need abit of work too. Congratulations on your new dt place. Thankyou for joining us at Creative Craft World for our holiday fun challenge. Beautiful layout and fantastic take on the sketch! I love your choice of photo's and dp! To take my photos i usually tack the LO to a wall near a window and take it square on or lay it on the floor in the garden and stand directly over it. I struggle with photographing pages too! Gorgeous page, congrats on your new DT place. Thanks for joining us at Creative Craft World & good luck. Love your LO. Thanks for taking up our challenge at Creative Crasft World. Gorgeous layout, looks like it was a FUN day! Thanks for joining us over at Creative Craft World for our HOLIDAY challenge. Can't wait to see more for the DT!